The Dow ended flat on Thursday after steep earlier losses in volatile trade. 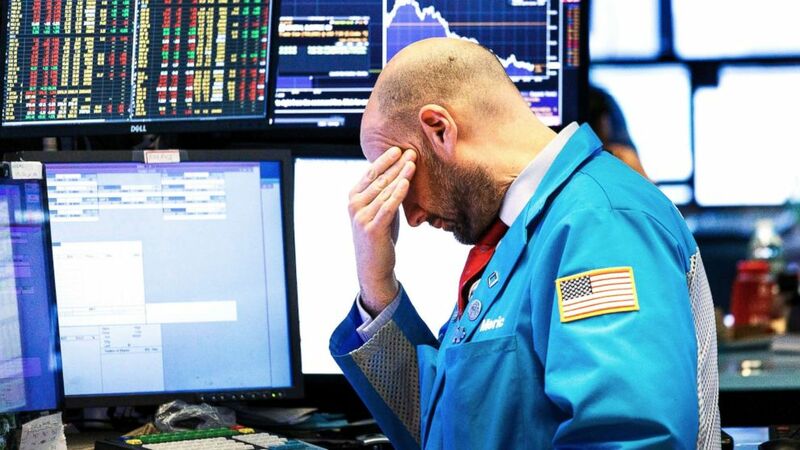 The Dow Jones Industrial Average ended flat Thursday, paring intraday losses of nearly 800 points that were stoked by fears of a sidelined trade deal after a Chinese telecom executive was arrested in Canada on behalf of the U.S., adding to concern about trade tensions with China. The Dow recovered on hopes that the Federal Reserve would slow rate hikes, traders said. The index closed 0.3 percent lower at 24,948 points. "Investors initially took the arrest of Chinese telecom giant Huawei’s chief financial officer as a negative signal on U.S.-China trade relations only to erase most of those losses by the close on hopes the Fed will slow its interest rate hikes to boost the economy," Alec Young, managing director of Global Markets Research, FTSE Russell told ABC News. (Justin Lane/EPA via Shutterstock) Traders work on the floor of the New York Stock Exchange in New York, Dec. 2018. The tech heavy Nasdaq ended half a percent lower at 7,188 points, and the S&P 500 also closed the day basically flat, down 0.2 percent at 2,696. The market is still down for the week on nagging concerns that a trade deal with China would not be reached. Fears of an upcoming recession also persisted. Canadian authorities arrested Huawei CFO Meng Wanzhou on behalf of the U.S. over the weekend. Huawei is the world's largest telecommunication equipment company and second largest smartphone maker behind Samsung. Wanzhou is the founder's daughter and heir apparent. Huawei is also an example of what the Trump administration is targeting in its trade dispute with China. It receives preferential treatment and is heavily subsidized by the Chinese government while purchasing technology from U.S. companies like Qualcomm. The move by the U.S. is related to concerns that Beijing could be using Huawei's technology to spy on Americans. The Justice Department also believes Huawei is violating U.S. sanctions against Iran. The political moved rattled investors. "Traders are reducing the odds of a trade deal with China since the arrest of Huawei’s CFO," Michael Matousek, head trader at U.S. Global Investors, told ABC News. "Also, talk about the probability of recession has been gaining traction due to the yield curve getting close to inverting." The spread on the yield curve is the difference in the yields between the two-year government note minus the 10-year government bond. "When interest rates for shorter-term securities is greater than the longer-term securities, borrowing becomes more expensive, so consumers tend to slow purchases and businesses have less expansion. In time, this causes a slowdown in the economy and possibly a recession. Investors seem to be worried that the possibility of a recession might be looming," Matousek added. (Justin Lane/EPA via Shutterstock) A trader works on the floor of the New York Stock Exchange at the closing bell in New York, Dec., 4 2018. 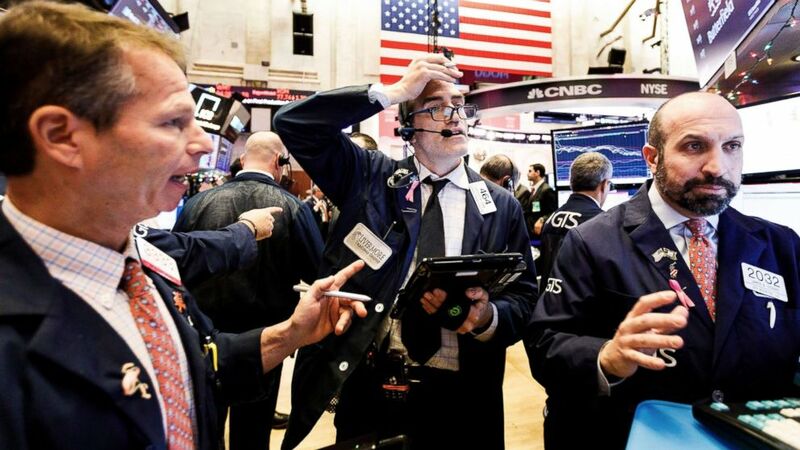 Doubts over a trade deal with China contributed to the Dow's drop of 800 points on Tuesday. ABC News’ Karson Yiu contributed to this report.